Detail from ‘Interior of an Inn’, by Robyn van der Goes. Rijksmuseum, Amsterdam (CC0 1.0 Universal). 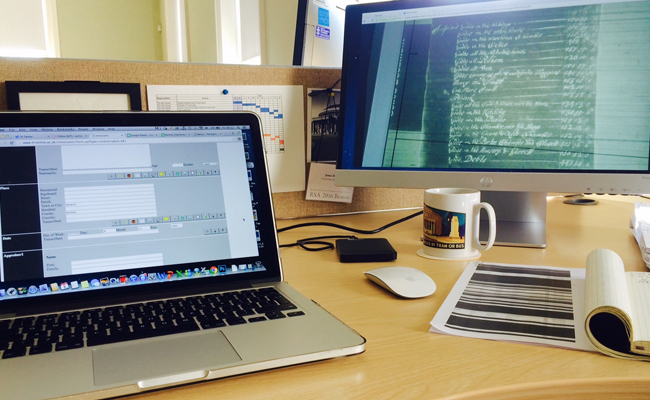 Since completing our work on governance late last year, between January and April we’ve been hard at work on the source type related to our fourth and final work package on the material culture of intoxication: probate inventories. Ably assisted by project intern Muriel Munguia (who shares some thoughts below), we’ve databased a total of 630 intoxicant-related probate inventories from our case study sites of East Anglia and the North West (focussing on Chester, Norwich, Manchester parish, and the borough of Thetford), featuring 1,474 appraisers, over 5,000 rooms, and over 30,000 individual entries. One of four key document types generated by the process of settling the will and administering the estate of the deceased – the other three being wills, bonds, and accounts – probate inventories are detailed lists and valuations of an individual’s movable goods prepared on their deaths by friends, neighbours, and colleagues. Delegated before 1858 (like all aspects of probate) to the ecclesiastical courts, they survive in vast numbers in diocesan record offices across England – especially before the 1720s – and have long been a mainstay of social, economic, and cultural historians. 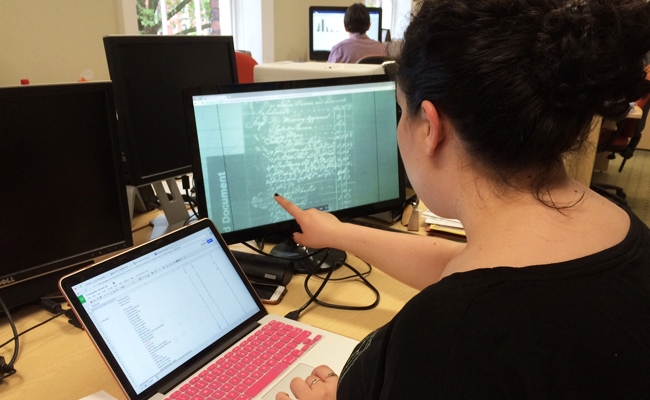 Extracting information from probate inventories using our data creation interface at HRI Digital. Working with the excellent collections in Norfolk Record Office, Cheshire Archives and Local Studies, and Lancashire Record Office, we’ve used online catalogues and other finding aids to identify 450 inventories taken for people with named intoxicant-related occupations (including apothecaries, brewers, cooks, confectioners, distillers, grocers, innholders, pipemakers, vintners, and tobacconists) for the period 1580 to 1740. By cross-referencing the 9,472 retailer names collected during our work on licences with the probate material, we’ve also identified an additional 180 elusive alehouse-keeper inventories; record linkage is crucial here, since alehouse-keeping was nearly always a secondary occupation that (with a few exceptions) can’t be established from the trade stated on the inventory alone. Following useful discussions with our expert advisors Professor Jane Whittle and Professor Craig Muldrew at our probate inventories workshop back in November, we took the decision to capture all items listed in the inventories in order to set intoxicant-related commodities in their full material and spatial contexts. 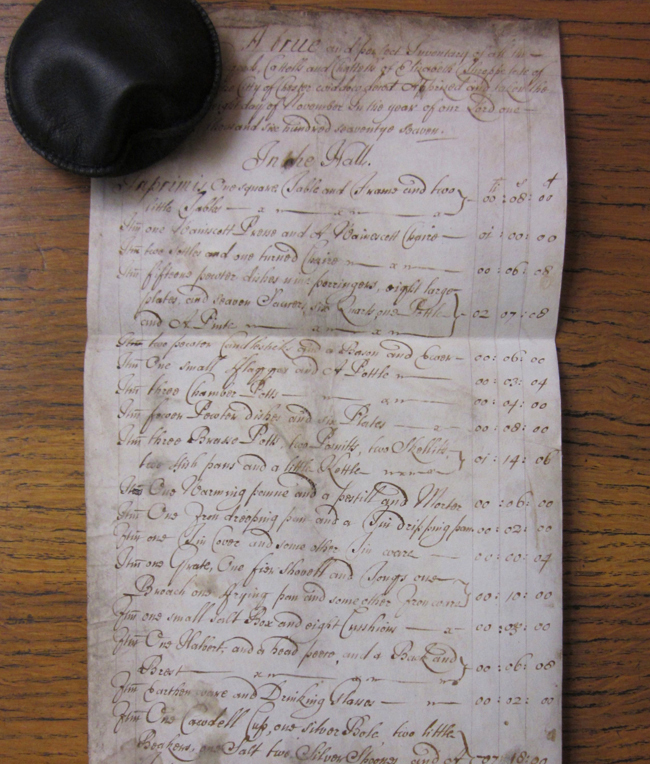 Detail from the probate inventory of Chester widow and alehouse-keeper Elizabeth Thropp, taken on 8 November 1677 and identified through record linkage. It reveals the contents of her hall (usually the main drinking area of alehouses), including tables, settles, and chairs; flagons and pottles; earthenware and drinking glasses; and silver cups, bowls, and beakers. Cheshire Archives and Local Studies, WS/1677. Firstly, and most obviously, as listings of consumer goods inventories can be used to trace the introduction, dissemination, and waning of intoxicant-related commodities both geographically and over time (from particular kinds of drinking vessel to new world stimulants such as tobacco, tea, and coffee). 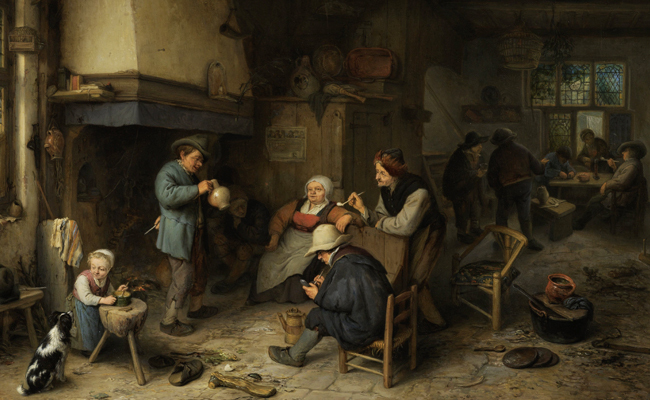 Secondly, since inventories nearly always itemise household contents on a room-by-room basis, they provide unique insight into the size, layout, and material culture of intoxicant-related environments (of particular value for commercial premises such as alehouses, taverns, inns, and coffeehouses). Thirdly, by including information about appraisers, indebtedness, values, and sum totals, they shed some light on the networks, financial operations, and wealth of producers, retailers, and traffickers. Fourthly, we’re using their detailed descriptions of intoxicant-related ‘things’ alongside material evidence from museums and archaeological excavations to create typologies for our final dataset of objects (a separate work package, overseen by Angela and involving archaeologist Dr Rachel Askew, about which we’ll be blogging shortly). Rooms with a View: Probate inventories are among our best source for the reconstruction of the interiors of commercial drinking places. 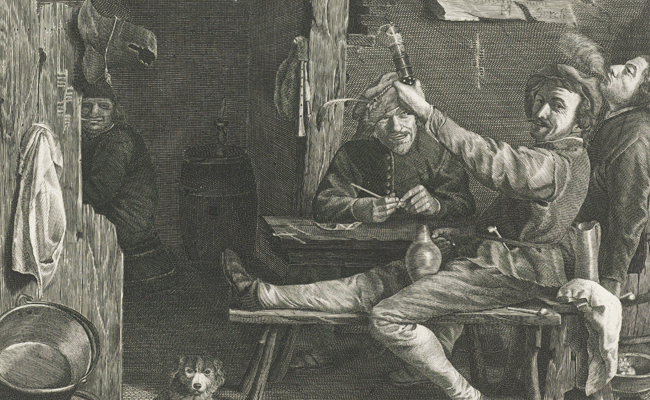 Detail from ‘Peasant Party Indoors’, by Adriaen van Ostade. Rijksmuseum, Amsterdam (CC0 1.0 Universal). These exciting analytical possibilities notwithstanding, probate inventories are not without their problems, all of which are well-rehearsed in the literature. They were taken and survive disproportionately for the wealthy (the ‘middling sort’ are best represented, from the lesser gentry down to craftsmen), and because they exclude real estate they’re a notoriously unreliable guide to overall wealth. There are also frustrating variations in the practices and thoroughness of appraisers (amateurs rather than church court officials), who often adopted a sparse and streamlined approach to their work; items of the same type (e.g. ‘the pewter’, ‘the plate’) or of low value (e.g. ‘the lumber’, ‘other trifling things’, ‘trumpery’) are frequently lumped together, while the contents of entire rooms are sometimes simply listed as ‘goods’ with a single valuation under the relevant heading. The valuations provided are subjective and highly variable. 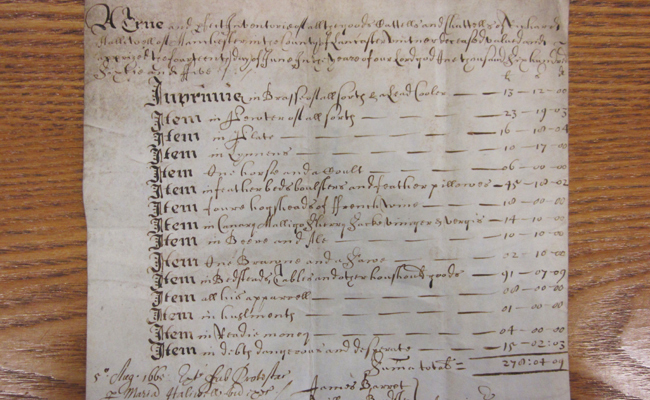 Detail from the probate inventory of Manchester vintner Richard Halliwell, taken on 14 June 1665. While still useful – especially in its description of the different wines in his stock – the lack of room information and a tendency to lump goods of the same kind together (‘pewter of all sorts’) make it less revealing than fuller examples. Lancashire Record Office, WCW/1665. However, despite these caveats, they remain our single best entry point into the material worlds of our protagonists, and we’re excited to share the results of this work package – alongside those of our previous three – in our database when it launches at the end of the year. Muriel hard at work on a Norwich tobacconist’s inventory from the early eighteenth century. I am currently a postgraduate student pursuing an MA in Librarianship at the University of Sheffield, and I became an intern for the Intoxicants and Early Modernity Project at HRI Digital through the university’s Postgraduate Advantage Scheme, which provides 100-hour paid internships for Taught Postgraduate students in the Faculty of Social Sciences. The scheme, which is co-ordinated by the university’s Career Services and funded by the Faculty of Social Sciences, aims to provide work experience with various organisations such as: charities, community groups, social enterprises, small commercial firms, and public sector organisations, that may otherwise be unable to host an intern. Before moving to the UK and beginning my MA, I worked at The Huntington Library as a reader services assistant in the Ahmanson Reading Room, and completed metadata entry for the Native American Photographs Project in the Huntington Digital Library. Through this experience I developed an interest in special and digital collections, and I hope to work with these types of collections again after completing my MA in September. I had heard from one of my lecturers about the types of projects the Humanities Research Institute has been involved in and many included my interests in special and digital collections, so when I became aware of the Postgraduate Advantage Scheme, HRI Digital was one of the first organisations I approached about a possible internship. As an intern for the Intoxicants and Early Modernity Project I have been examining probate inventories and transcribing the desired information onto spreadsheet templates to be ingested into its forthcoming database. Although I had done transcribing as part of the metadata entry for the the Huntington Digital Library, transcribing the forty-three probate inventories assigned to me was quite challenging in the beginning due to the early style of handwriting, as well as early spelling and vocabulary (I was mainly working on material from the early eighteenth century). Once I became familiar with the various spellings and the vocabulary used, however, the inventories became a bit easier and more interesting to read. While some of the inventories have been so difficult to read I’ve had to pass them off to James, for the most part I have enjoyed developing my palaeography skills and being able to examine some attractive and interesting handwriting. Indeed, in many cases, sometimes all it took to figure out a particular word was to put it aside and return later with a fresh pair of eyes. On some occasions I couldn’t decipher a word, but as soon as James began reviewing the inventory and data extraction with me, I knew what the word was before he verbalized it. Despite the difficulties I sometimes had, as I progressed through the inventories I was pleased to notice that my ability to read early handwriting was improving, and I look forward to developing this skill further. Although they required more work due to their length, I have enjoyed transcribing the more highly detailed inventories the most. These typically belong to grocers and innholders, and even though they can sometimes become tedious, they are usually more interesting. Perhaps it’s because I always been a bit nosey, but learning what types of possessions people had in the eighteenth century, as well as which rooms they were kept in, has been fascinating to discover, particularly when something unique, or that is no longer in use, has been described. In the end I am grateful to have had the opportunity to assist with the Intoxicants and Early Modernity Project. Having the opportunity to work with these probate inventories, although challenging at times, has been very gratifying and I have enjoyed the peek into the past they have provided. T. Arkell, ‘Interpreting Probate Inventories’, in idem., N. Evans, & N. Goose (eds), When Death Do Us Part: Understanding and Interpreting the Probate Records of Early Modern England (Oxford, 2000), pp. 72-102. C. Muldrew, Food, Energy, and the Creation of Industriousness: Work and Material Culture in Agrarian England (Cambridge, 2011), esp. pp. 163-207. M. Overton, J. Whittle, D. Dean, & A. Hann, Production and Consumption in English Households, 1600-1750 (Abingdon, 2004), esp. pp. 13-32. S. Pennell, ‘‘Pots and Pans History’: The Material Culture of the Kitchen in Early Modern England’, Journal of Design History 11 (1998): 201-16. M. Spufford, ‘The Limitations of the Probate Inventory’, in J. Chartres & D. Hey (eds), English Rural Society, 1500-1800: Essays in Honour of Joan Thirsk (Cambridge, 1990), pp. 139-74. L. Weatherill, Consumer Behaviour and Material Culture in Britain, 1660-1760 (2nd ed., London & New York, 1996), esp. pp. 2-4, 201-14.